It seems recently that a day doesn't go by without some rhythm game announcing new artists, new albums, or new features for the forthcoming versions of their franchise, and XS Game's PopStar Guitar wants in on some of that hot announcement action. In a press release that claims to be announcing four new blockbuster tracks, five new tracks are listed, which I assume means one of them isn't blockbuster enough. Is it Rihanna's "Shut Up and Drive", "SOS" by the Jonas Brothers, "See You Again" by Hannah Montana, or "Wake Up Call" and "Makes Me Wonder" from Maroon 5? Whichever of the selections is deemed unworthy of blockbuster status, one thing is perfectly clear: the demographic for this Wii and PS2 game does not include me. Should sell like hotcakes to preteen girls and their creepy admirers though.XS GAMES TURNS UP THE VOLUME ANNOUNCING FOUR NEW BLOCKBUSTER TRACKS FOR POPSTAR GUITAR™ Master Tracks From Rihanna, The Jonas Brothers and Maroon 5 to be Featured in New Music Rhythm Game for the Wii™ and PlayStation®2 computer entertainment system NEW YORK, NY - September 10, 2008 - Videogame publisher XS Games announced today that hit songs from 2008 MTV Video Music Award nominees and performers Rihanna and The Jonas Brothers, will be featured as master tracks in PopStar Guitar, a new music rhythm game for the Wii™ and PlayStation®2 computer entertainment system. Players will be able to unlock their inner pop star as they perform live versions of these chart-topping hits by popular artists. Pop Star Guitar # 1 Hits include: · Shut Up and Drive by Rihanna · SOS by The Jonas Brothers · See You Again by Miley Cyrus · Wake Up Call by Maroon 5 · Makes Me Wonder by Maroon 5 "To deliver an authentic pop music experience in PopStar Guitar, we knew we had to include original music from today's hottest artists," said Steve Grossman, chief executive officer of XS Games. "PopStar Guitar's music coupled with the innovative AirG peripheral for the Wii, will enable players to jam like a real star." In PopStar Guitar, players assume the role of a lead guitarist on a musical journey, beginning in a garage band and eventually progressing to the main stage of a worldwide "Battle of the Bands" competition. The game features twelve playable characters, 25 visually stunning venues and more than 50 pop songs, including many # 1 Hits from the original artists. Players can customize their band and give them a unique look, as well as win a number of VIP vehicles, so their band can travel like real pop stars! With three difficulty levels, PopStar Guitar will feature a single player Career Mode along with single player and multi-player mini-games. 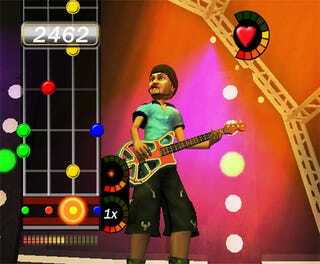 Developed by Broadsword Interactive, PopStar Guitar will be available for the Wii™ and the PlayStation®2 computer entertainment system. The Wii™ version of PopStar Guitar will feature the AirG™, an exciting new peripheral that snaps onto the Wii Remote™ and transforms the controller into an air guitar. For PlayStation®2 system players, PopStar Guitar will function with any 5 button PlayStation®2 system compatible guitar. Available November 2008, PopStar Guitar is rated "Teen" by the ESRB.